The SC determines the time when Hindu should burst firecrackers during Deepavali, the height of Gokulashtami pyramids etc. After 70 years of heavy secularism a PIL has been filed in the Supreme Court objecting to Sanskrit quotations like “Asatoma sadgamaya” (lead me from falsehood to truth) in official usage and the Supreme Court, which felt that the issues raised in the PIL are of ‘seminal importance‘, has constituted a five-member Constitution bench, to hear the matter. We committed a historic blunder in 1947 when we decided to be a secular republic. Pakistan and Bangladesh have declared themselves to be Islamic republics. In India, the SC determines the time when Hindus should burst firecrackers during Deepavali, the height of Gokulashtami pyramids etc. But, everybody is okay with mosques blaring loudspeakers five times daily reminding the kafirs that there is only one god and he is Allah. Everybody is okay with the church merrily abusing the right to religion and aggressively converting lakhs of Hindus and that too with foreign funds. Minority schools are exempt from implementing the Right to Education Act. The burden of educating poor children is entirely that of Hindu institutions. Great Congress leader Manmohan Singh, stated in his official capacity as the PM that the minorities, especially the Muslims, have the first claim to the nation’s resources. Hindus can wait in the queue for the leftovers if any. Akbaruddin Owaisi openly demands that the police be confined to the barracks for only 15 minutes and the 25 Crore Muslims will eliminate 75 crore Hindus. The man continues to move freely spewing pure venom. The courts are not showing any urgency in deciding the Ramjanambhoomi issue which has been pending for decades even as Lord Ram continues to live in a ramshackle tent. There is massive scientific evidence of the existence of a temple beneath the Babri site dug up under the supervision of an honest Muslim ..yet the issue remains pending for ages. Babri was built by a Shia and the Shia Wake Board has no objection. Yet…I think at this rate someone will file a PIL objecting to judges with Hindu names hearing cases since their commitment to secularism is suspect. Advocate and Senior Journalist who was formerly City Editor & Chief of Bureau of The Times of India, Mumbai. He has also served in the MumbaiMunicipal Council. Previous articleCoalition with Congress can be injurious to your health! 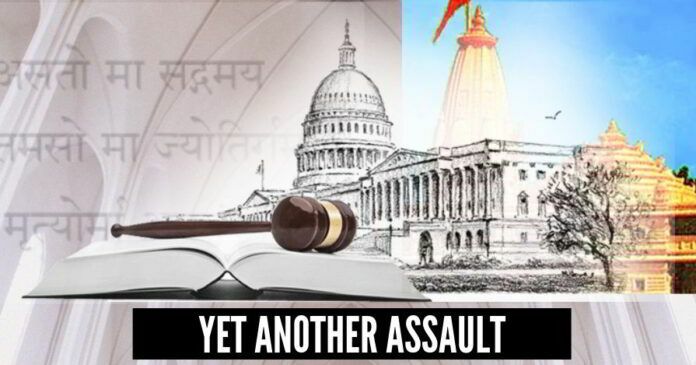 Next articleAcquiring land for Ram Mandir – Is BJP fulfilling its election promise or is it a political move? Hindus should go to court saying Sunday holidays are Christian and hence not secular. Also uniforms in schools demanding wearing pants are Christian hence not secular. The historic blunder you talk about was committed in 1976 when Indira Gandhi inserted SICKULAR into the constitution and not in 1947. We have never used the term “secular” when constitution was drawn up in 1950. It was during 1975/76 during Indira Gandhi’s rule, the term ‘Secular’ was added. BJP should promise in its manifesto to remove these anomalies from our constitution.